Typical uses/applications: Mission-critical, life-safety and healthcare facilities that require an on-site redundant fuel source and facilities with natural gas curtailments agreements. Propane-air is an effective back-up fuel for high-efficiency, natural gas fired boilers. 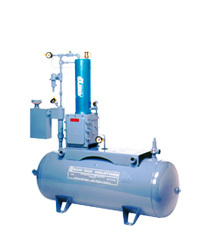 Propane-air can also be used to continue operation of other appliances including kitchens, independent space heating equipment, domestic water heaters, etc. Natural gas-air is an excellent back-up fuel for low heat content bio-gas applications such as anaerobic digesters and landfill gas. The natural gas can be blended with air to match the properties of the biogas to supplement periods of reduced production. Power: Electric for control and vaporization in smaller systems. Electric for control and propane for vaporization in larger units. Capacity/pressure: Systems can be engineered to meet a wide variety of capacity and pressure requirements. Want to hear more about the latest propane systems and explore the best option for your organization? Contact us to set up a no-obligation Lunch and Learn.